Automation: Flavor of the month or disease of the decade? Last year's buyer's summit saw 48% polling they needed to let go and entrust their service provider in higher value processes... now that number is dropping to 28%, with the preferred partnering focus shifting to working jointly on an automation strategy. Nearly half of today's buyers (45%) now see that as the main area to get renewed value. As mature outsourcing deals get stuck in holding patterns, automation is providing the new flavor to find that next increment of value. The industry hype and marketing is clearly reaching the buyer - and many want their service providers to work with them to help figure out an automation strategy. So the real conversation now shifts to how buyers and providers can find common commercial models to make automation work for both parties. However which way we look at this, buyers will need to make some new investments in Robotic Process Automation technology and expertise, while the service providers will ultimately have to concede they may need to reduce the FTE provision on their side, as automation takes effect. Now, the real challenge here is for the service provider to redeploy the freed-up FTEs on their clients' higher value processes. So these two motivations should go hand-in-hand: decreasing labor effort on automatable tasks and increasing it on the higher value work the clients would like to outsource in the future. 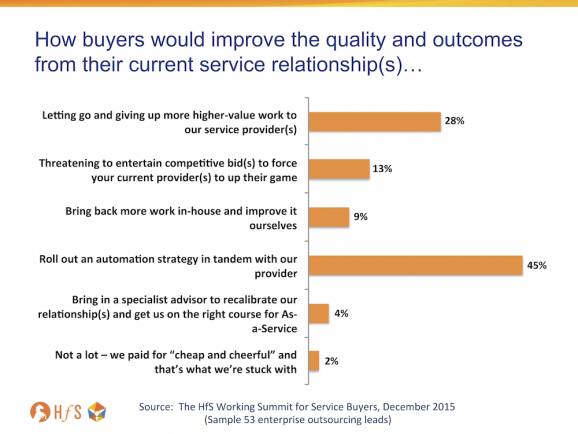 So if buyers and their providers can get this right, automation will be a long term play for both parties, where higher value work gets done and delivery staff are kept busy because of the closer collaborative relationship and greater volume of work being parsed out. 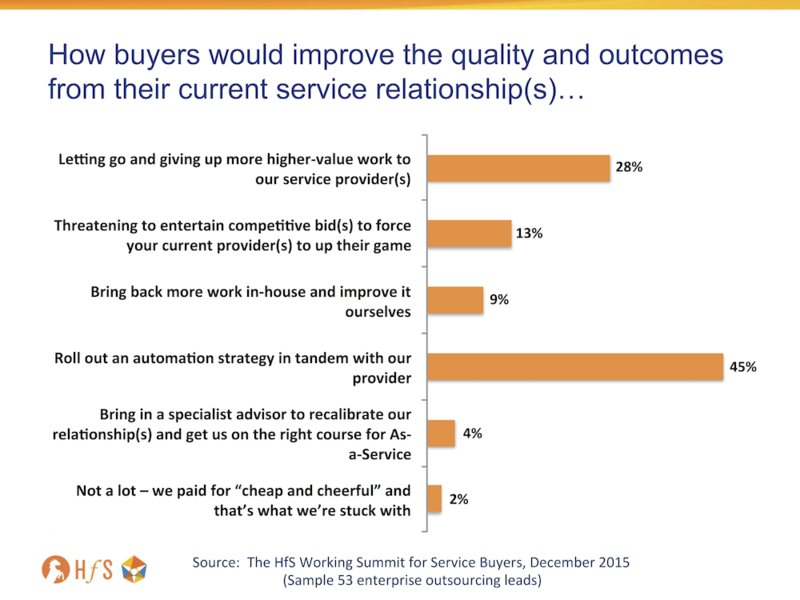 The results (Last year’s buyer’s summit saw 48% polling they needed to let go and entrust their service provider in higher value processes… now that number is dropping to 28%, with the preferred partnering focus shifting to working jointly on an automation strategy. Nearly half of today’s buyers (45%) now see that as the main area to get renewed value.) could be interpreted to indicate Providers couldn't deliver on the high-value work entrusted to them last year by the Buyers and the Buyers have come to realize they will have to work closely with the Providers to implement automation to drive (force) down headcount on the Provider side; saving funds to shift to the high value work either internally or with a capable Consultant/Provider. Identifying automatable tasks and understanding full system functionalities and how they can relate to the business are 2 most important steps in successfully deploying robotics. If not correctly articulated, automation could lead to higher cost than maintaining manpower. Advanced technology and automation is side by side. The rate automobiles showing features in the same manner the control system need to be advanced and flexible to manage the machinery. Good to see the post! It's something interesting I got after long time. Thanks.